AUSTIN, Texas — The Campaign to Stop Stericycle (CSS) has learned that the medical waste giant Stericycle has been fined over $42,000 for the illegal dumping of aborted babies collected from an abortion facility in Austin. The Texas Commission on Environmental Quality (TCEQ) has released documents showing that Stericycle has been served with papers by the Enforcement Division, which slam the company with $42,612 in fines for illegally dumping the fetal remains of aborted babies into a municipal landfill. Stericycle has paid $34,090 in a lump sum, and the remainder has been waived contingent upon their future compliance with the law. Click here to view the documents served upon Stericycle from TCEQ. Stericycle’s violations were first discovered in April after an initial investigation was conducted into Whole Women’s Health in Austin. Click here to read the news release on the investigation. 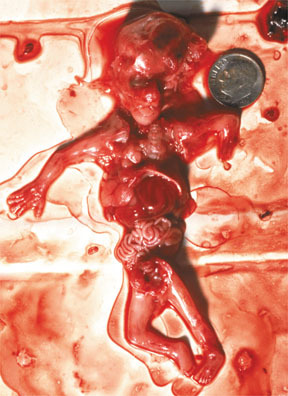 While Stericycle told the government that its policy is to incinerate fetal remains, it was found that the “waste” service had been autoclaving, or steam treating the aborted babies, and then dumping their bodies into a municipal solid waste landfill with household and commercial trash, which is unlawful under the Texas Administrative Code. Although Stericycle has been denying that it accepts aborted fetal remains for disposal, the information that company representatives provided to the government confirmed the truth. After a violation of the law had been established for the unlawful disposal of fetal remains, the case was sent to TCEQ’s Enforcement Division to decide the appropriate penalty. Whole Woman’s Health of Austin was fined $17,430, which is less than half of what was leveled against Stericycle. “The large fines slammed against Stericycle demonstrate the severity of its horrifying and egregious actions in treating children like trash,” campaign director Michael Marcavage stated. “However, it is not surprising that these violations occurred since those that are involved with the abortion industry are partakers in its evil deeds. Stericycle’s claims that it is ‘protecting people, reducing risk’ are hypocritical, and businesses should be aware of its unethical practices,” he added. “We again call upon Stericycle to stop facilitating the abortion holocaust and to clean up its act immediately,” Marcavage concluded. This year, Stericycle was also found to be assisting notorious abortionist Kermit Gosnell, who is now awaiting trial for murder charges. In official court documents released by the Philadelphia District Attorney’s Office, it was explained that Gosnell’s employees would package the fetal remains for pickup by Stericycle, but that the medical waste giant stopped collecting when the abortionist failed to pay his bills. Gosnell then began stockpiling fetal remains in his freezer, which were later discovered by investigators. Click here to learn more.